With blown-out rivers on the horizon for mountain fisheries, many anglers are gearing up for spring tailwater fishing. This time of year can provide some of the best fishing, but it’s often paired with chaos, as anglers flock to the same rivers and “combat fishing” ensues. 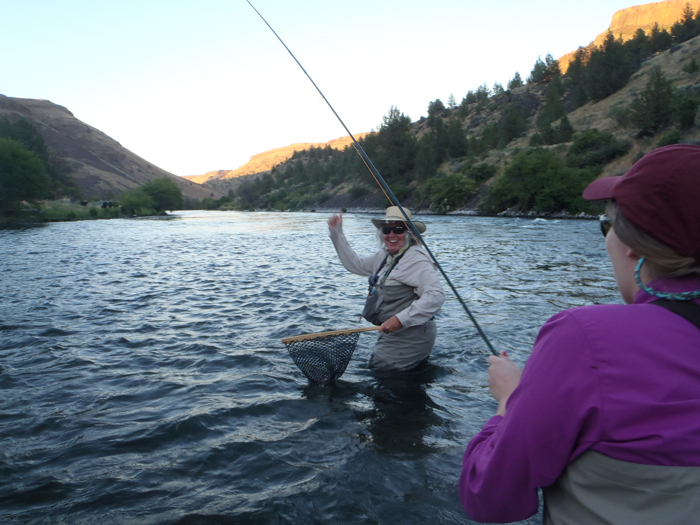 Instead of working on your snarl, or loading your fly pack with nunchucks, try some of these tips–from guide and FFI professional casting instructor, Mary Ann Dozer–to get you through those busy river days. Even if you decide to avoid the crowds and fish high waters or tackle the thawing lake, understanding these etiquette tips and teaching them to new anglers can help us keep the river a peaceful place through the summer months, as well. Before you hit the river, ask the local fly shop what you should know about etiquette for the specific river you are planning to fish. Every river seems to have its own fly-fishing culture, so any research you can do prior to hitting an unknown-to-you river would be helpful. Whoever is on the water first has the first right to that stretch of water; this includes those gearing up next to the river, as well. If you’re unsure if the anglers next to the water are arriving or leaving, just ask them. If a an upstream angler approaches a downstream angler, the upstream angler has the right of way, since it’s easier for the downstream angler to move. Most anglers cast and fish effectively within 50 feet. So the general rule is to fish at least 100 feet away from another angler, counting their space and your space. If you can see what sort of gear the angler is using, you are too close. If you come across someone fishing a stretch, it’s nice to ask them if they mind you fishing up- or downstream from them. Guide Mary Ann Dozer nets a fish for a client. If the boat has oars, it is the rower’s responsibility to navigate around a stationary angler, as long as they can pass safely. However, if the boater can’t navigate around the stationary angler, then the stationary angler needs to move. Communication is key, in this situation, so don’t be afraid to speak up. In all cases, the anglers on the boat should not fish the stationary angler’s water. Now what happens with float-tubers who have no oars? The general rule is that tubers do have the right of way because they cannot easily navigate. With elbow-to-elbow fishing, you don’t need to be yelling cuss words every time you lose a fish, and likewise, you don’t need to scream your head off if you net a fish. After all, more times than not, catching is about having the right fly at the right time–and that doesn’t make you the expert. Feel free to ask an angler how their day is going and share what fly is working for you, if they seem interested. If you notice a new angler who is stumbling around and isn’t aware of the river etiquette, try to kindly educate them in a non-confrontational manner. If a gear fisherman steps in your water, stand your ground, but realize they have a different set of ethics and rules of fishing sometimes. If you’re fishing next to an angler who is basically breaking all of these suggestions, it’s wise to move to another stretch of water; because after all, it’s your day to fish and you don’t want to waste it babysitting or trying to change other people. Kaitlin Barnhart is a freelance writer, co-founder of The Mayfly Project, and supporter of 50/50 On the Water. She contributes to a variety of publications and enjoys fishing wild rivers in North Idaho with her family. Also important to mention the reds.